If you are a fan of all things crunchy, you must make this pecan-orange granola with dried cranberries soon! It beats any granola from a box, including Bear Naked granola, my favorite… until now. My mom forwarded me this granola recipe from the latest Cooks Illustrated magazine. When I stopped by her house for a quick lunch this past week, I was pleasantly surprised to see and smell the wonderful aroma of freshly baked granola. It’s an extremely easy recipe to make. Simply combine all of the ingredients except the dried fruit, and bake for 40-45 minutes. Next, let the granola cool and harden for 1 hour before breaking into crunchy clumps of desired size and tossing with the dried cranberries. 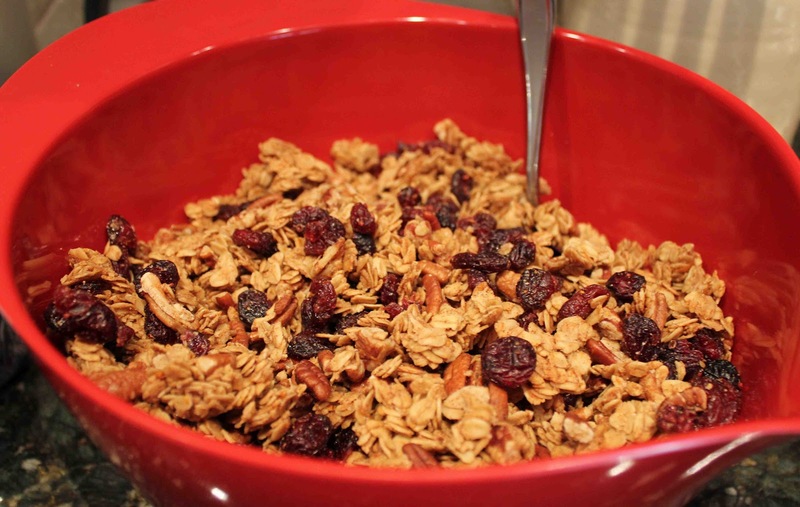 As far as taste goes, I could probably eat all nine cups of this granola…it is that good! The combination of maple syrup, brown sugar, vanilla, cinnamon and orange zest make for a warm and comforting snack that is seriously addicting. Sprinkle granola over Greek yogurt, serve it in milk like you would cereal, or munch on it plain as a mid-morning or afternoon snack. Enjoy! 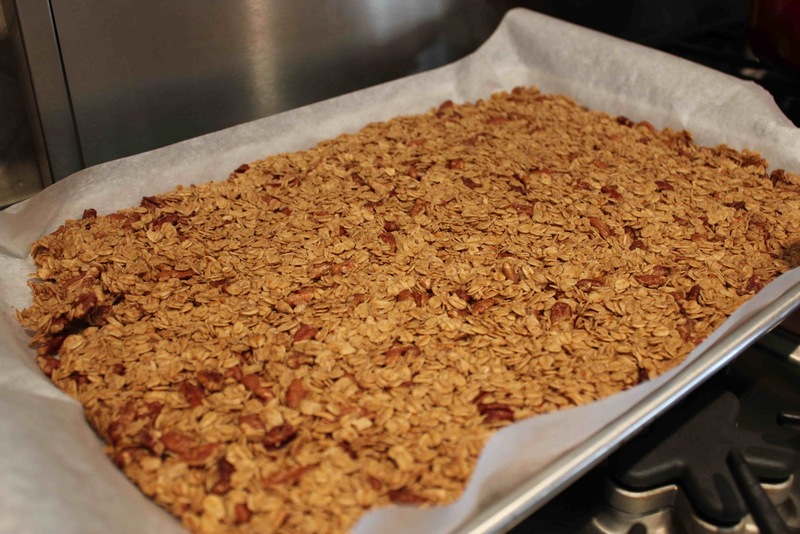 Bake granola for 40-45 minutes in a 325 degree oven. Let cool for 1 hour. 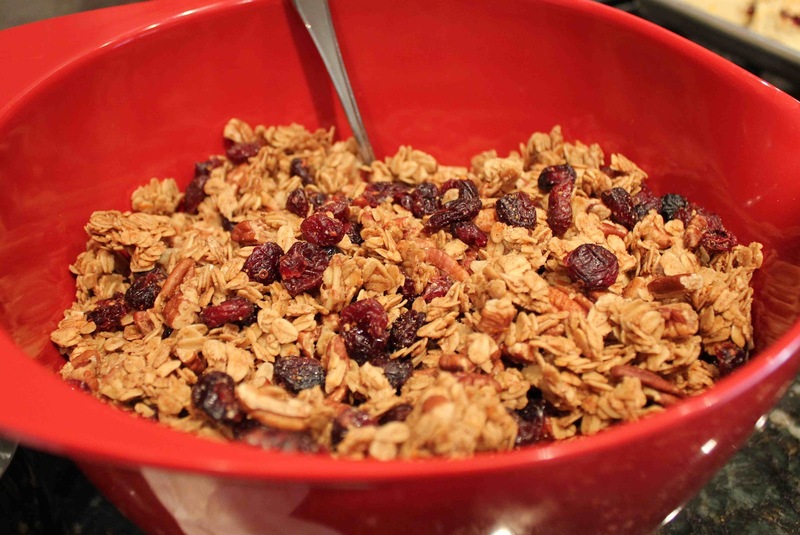 Break granola into pieces and toss with dried fruit. 1. Adjust oven rack to upper-middle position and heat oven to 325 degrees F. Line rimmed baking sheet with parchment paper. 2. Whisk maple syrup, brown sugar, vanilla, orange zest, cinnamon and salt in large bowl. Whisk in oil. Fold in oats and nuts until thoroughly coated. 3. Transfer oat mixture to prepared baking sheet and spread across sheet into thin, even layer (about 3/8-inch thick). Using stiff metal spatula, compress oat mixture until very compact. Bake until lightly browned, 40 to 45 minutes, rotating pan once halfway through baking.